The Kick-Off Meeting of the Baltic Fracture Competence Centre (BFCC) took place on the 21st and 22nd of April in Hamburg. 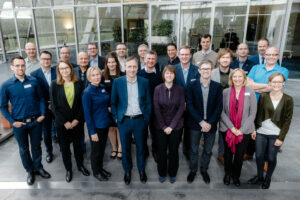 The BFCC is a Baltic Sea region-wide collaborative project which got awarded with €3.6 M from the Interreg Baltic Sea Region Programme last December. It will foster an international approach to face the challenges of fracture management. “Treatment and prevention of fractures are important health topics of our time. 40,000 fracture based operation have been performed in Demark alone last year. The common goal of all project partners is to establish a transnational data base which will help to investigate questions at an international level and enable a quick and effective treatment of patients.” says Prof. Wolfgang Hoffmann (Ernst-Moritz-Arndt-University of Greifswald, Institute for Community Medicine) who is responsible for the development of the transnational fracture registry platform. Over the next three years, 14 project partners from industry, universities, hospitals and cluster organisations will work closely together to develop and establish a transnational collaboration platform including a bone fracture registry. This registry will implement data from two existing registries from hospitals in Denmark and Sweden and four new registries from hospitals in Poland, Lithuania, Estonia and Germany. The platform will enable to efficiently compare processes and results in fracture treatment across institutions and countries.